Oil on canvas, 30 x 25 in. 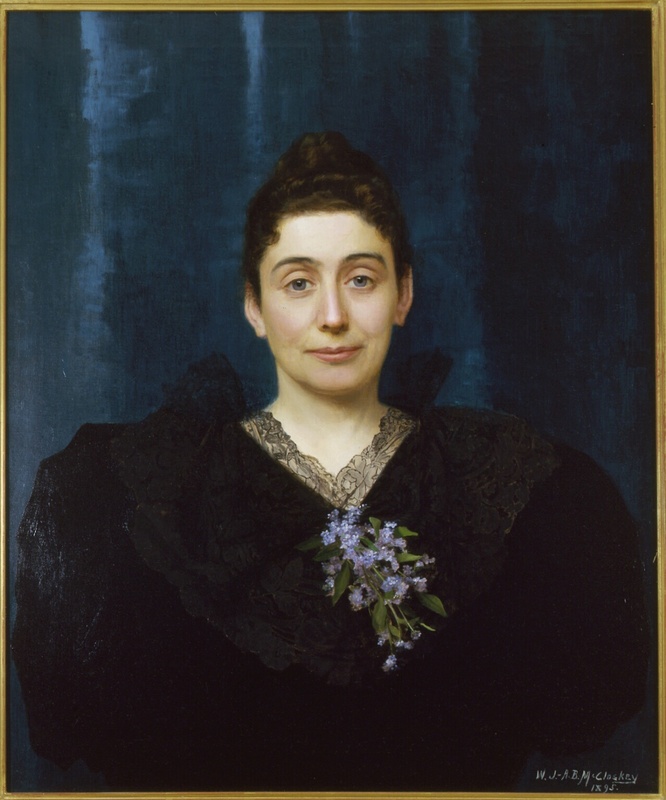 Although both McCloskeys were talented artists who individually painted portraits, genre pictures and still lifes, they also worked together on paintings, particularly portraits. Seeking commissions, they continually moved from one to another of America’s largest cities where they publicized their arrival, held salons to display the quality of their work, garnered commissions, and painted likenesses. Many prominent citizens were their clients. The sitter in Untitled is currently unknown but probably lived in Los Angeles, as the McCloskeys spent much of 1894 and 1895 in that city, and the painting surfaced at an auction here. Portraits are made in standard formats: head shot; bust-length, half-length, full-length, seated, and standing. Untitled is half-length. Some portraits have elaborate backgrounds, but the McCloskeys usually restricted theirs to a single-color drape, the color selected by holding various colored panels next to the sitter’s face to find the most complimentary. Such a background was less costly. The lace on this woman’s dress suggests she was wealthy and the black color that she was a widow; the violets may refer to her name or to her habit of wearing them or to her femininity or may simply reflect Alberta’s enjoyment in rendering still life objects in trompe l’oeil. Provenance: Abells auction, LA, June 28, 1984, lot 765; exhibitions and publications: exhibited, 75 Works 75 Years Collecting the Art of California, Laguna Art Museum, Laguna Beach, Ca. April 2 - July 11, 1993, and reproduced in the catalogue in color p. 19; exhibited Loners, Mavericks & Dreamers: Art in Los Angeles before 1900, Laguna Art Museum, Laguna Beach, Ca., November 26, 1993 - February 20, 1994 and Monterey Peninsula Museum of Art, June 4 - September 18, 1994, Cat. 51 and reproduced in catalogue in color p. 80; Laguna Art Museum, various shows.